It’s not the 80s or the 90s, when one could easily control the flow of information and try to shape narratives. It’s 2018! It’s the age when everyone is equipped with pocket-sized devices with screens, showing crowd sourced information in real time. It seems as if the mainstream media has not understood this yet. Though it is true that the private media industry is relatively new in Pakistan,this is no excuse for its outdated practices. The media is supposed to be the Fourth Estate. It’s supposed to work towards the betterment of democracy and the strengthening of democratic institutions. It is not meant to bring them down by colluding with anti-democratic forces. How can you claim to be a free media organisation when you became party to the suppression of indigenous and democratic movements like the Pashtun Tahafuz Movement (PTM)? And to make things worse — when you amplify manufactured movements that are meant to counter real movements? 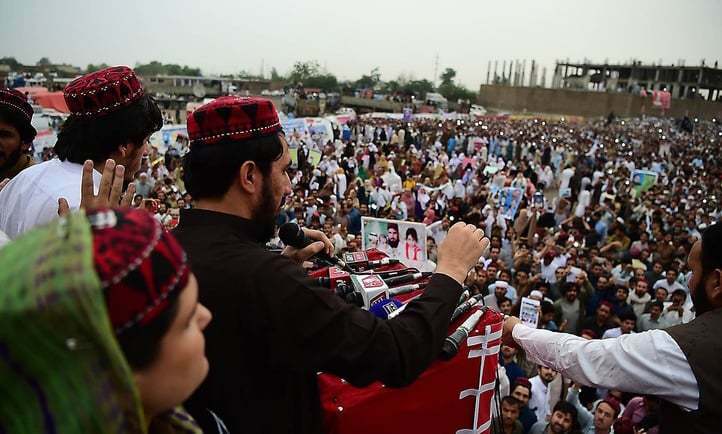 We have seen from Sunday’s PTM rally that it was social media that bridged the gap when majority of the mainstream media turned a blind eye to it. By pretending that a movement hasn’t taken place – even if you did because you were being told to by certain elements – you became a party to suppressing a democratic movement. And when you do things like that, my fellow countrymen and I will look at you with doubt. Whole #Pakistani nation stands with Pashtun Long March and Pashtun Tahafuz Movement @PashtunTahafuz. Media blackout of #PashtunLongMarch2Peshawar is really condemnable. Millions of Pashtunes are on roads. Hats off to brave Pashtun nation for standing up. Yet the same mainstream media has the audacity to exploit the so called drawbacks of the relatively young social media. Several mainstream anchor-persons have called for blanket bans on various social media outlets in the past. Using fake news, privacy issues and ‘blasphemy’ as excuses the mainstream media tries to build the perception that social media is not the future, and that the audience should stick to them for reliable information. There is no denying that social media has grave issues like fake news, data and privacy issues. However, this does not mean that the solution is to forsake it and revert to conventional forms of communication. Surprisingly, it’s not just the mainstream media anchors that promote banning social media. Shockingly, some so called digital rights activists have also advocated shutting down social media accounts in the name of privacy. Privacy is certainly an issue – actually it’s the issue of the day, given recent developments – but our fight for privacy rights has to go hand in hand with our fight for the right to free speech. As to the assumption of mainstream media being somehow superior, know that it also has every social media ‘flaw’ it has pointed out itself. Have mainstream media outlets not been guilty of running fake news, censorship and even fabricating stories? It’s the same media that gets involved in in-fighting and leaves no stone unturned to bring the competition down. We have seen reckless use of blasphemy and espionage allegations being used against opponents for this very purpose. We have also seen mushroom growth of news channels with shady owners trying to dictate their own brand of patriotism and religion on viewers. At times like these, one has to ask: is the mainstream media really independent? Can they be trusted to cover democratic movements in a country that is struggling to keep its Constitution afloat and strengthen democratic institutions? Not without social media. And with these magic devices with screens and processors in everyone’s hands, we can act as watchpersons and keep the authorities in check. We can even call out the mainstream media outlets when they pull anti-democratic moves, as they did on Sunday. Therefore, all hail social media. All hail Pakistan’s democratic future. Published first in the Daily Times on April 11, 2018.